Throughout the site, you will see images or icons and, below them, a label and view details button. The label describes what you’ll find if you click on the image. Here, clicking on the picture of Mabel Choate takes you into the contents of the Mabel Choate Papers Regarding Naumkeag – photographs, plans, and other materials relating to Choate’s work maintaining and enhancing Naumkeag. This is the fastest way to move through the collections catalog. But if you want to know more about you’re looking at, click on view details. This will show you more information about where you are on the site and what you’re seeing. Again, clicking on view details here will take you to a description of the Mabel Choate Papers and how the collection is organized. From there, you can select the browse record button in the upper right corner and you’ll move further into the collection. This is also how you learn more about specific objects in our collections. 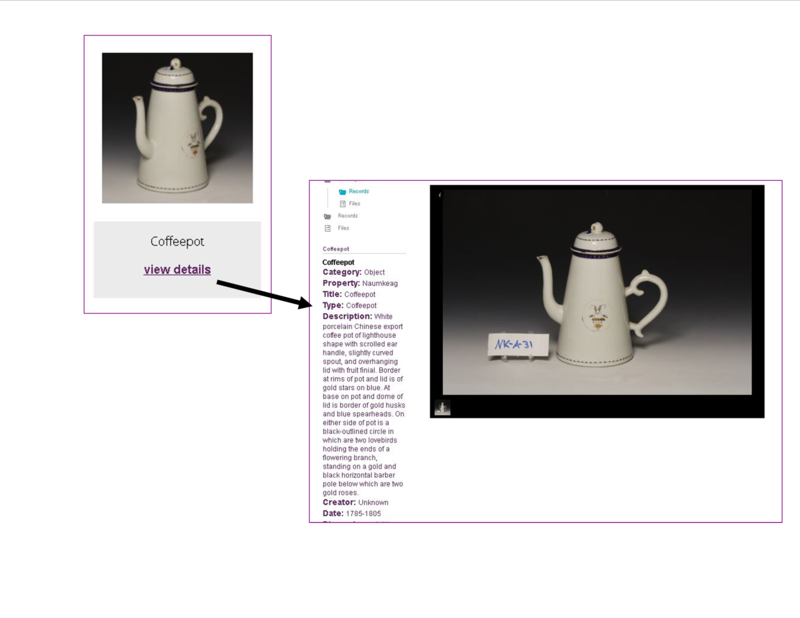 When the image and caption correspond to an item in a collection, such as the coffeepot in the example below, the view details button will take you to the catalog record that contains information including where the coffeepot originated, who made it, and out of what materials. For some items, you will also find additional images or searchable documents. 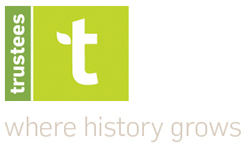 If at any point you want to return to where you started, you can use the back button in your browser or click on the green Trustees logo to return to the catalog’s home page. On every page of the catalog, you will see a search bar in the upper right of the page. This allows you to search either the entire catalog (archive) or the specific collection that you’re in (this collection) by adjusting the dropdown menu. In the example below, searching this collection for Monument Mountain would retrieve only results found in the William Cullen Bryant Homestead materials. Setting the search bar to archive would retrieve results from all collections in the catalog. *Quotation marks let you search a specific phrase. If you only want to see items about Charles Eliot, search for “Charles Eliot.” Searching for Charles Eliot without quotes will bring you any result that has the word Charles or the word Eliot. *Use AND if you want to only see items that have all the words in your search. Searching haskell AND hosta will return only items that have both words in them. *Use NOT if you want to only see items about one thing but not another. Searching mountain NOT monument will return items that include mountain but do share the word monument. *Use OR if you want to search two terms at once. Searching doyle OR farandnear will return results that have one or both of the terms. Once you’ve run your search, you can narrow the results down using two different methods. Use the search facets on the left side of the page to select the categories of results that you want to see. 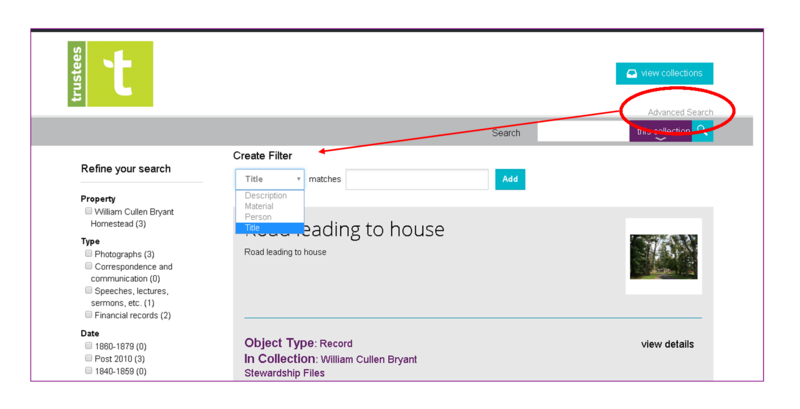 You can use the facets to narrow your results by a specific property, date range, subject, or other types of filters. If at any point you want to broaden your results again, simply unclick the facet option. The page will update automatically. If you only want results that have an exact term in a certain field, use advanced search. This feature searches the existing results for those that match the additional criteria. Click on advanced search right above the search bar and then select a field from the drop down menu. Once you’ve chosen the field to search, enter the term you’re looking for and click add. Advanced search and the search facets can be used together.